More than 100 people attended the first open house for the Downtown Corridor Alternatives Analysis. However if you missed the open house you can still see the presentation and the maps, and include your comments about the study. These are the various alignment alternatives being considered for the streetcar. A.”Bi-directional” options – both tracks running north and south on a single street. A reason to use single streets is expressed in the Nelson/Nygaard Comprehensive Service Analysis currently underway for the KCATA bus system. B. “Couplet” options – one direction runs on one street while the other direction runs on an adjacent street. All couplet options contain streets that are currently configured for two-way auto traffic (in whole or just sections). A reason to use couplets, when not necessary due to street constraints, is for the potential of greater economic development. Many people see rail as an engine of economic development and if the route is split onto two streets then it may generate additional development. South of 20th Street, all streetcars run on Main or Grand. Baltimore options divert to Main at 10th Street. The River Market is a large loop in all scenarios. 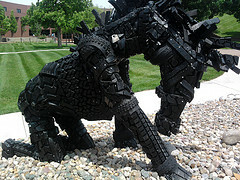 COMMENT FORM: Be sure to fill out a comment form about the plan. Visit KCSmartMoves to keep up-to-date with the study. As part of its Comprehensive Service Analysis (CSA), KCATA and the Nelson Nygaard team have developed proposed service guidelines for KCATA “Metro” transit services. This is a draft report and subject to change, yet it is developed to the point that the study team is presenting it to the Board of Commissioners on June 22. The service guidelines are intended to aid KCATA in designing route service, setting appropriate service levels, establishing minimum levels of service performance, and continuously evaluating route performance. In the context of the CSA, the proposed service guidelines will also serve as a primary tool in developing recommended service plans and educating riders and stakeholders about the plan and route design principles. At the June 22 KCATA Board Meeting staff will provide an overview of the draft transit service guidelines. June 21, 2011: The partnership team for the Downtown Corridor Alternatives Analysis will hold the first public open house to learn about the study and alignment alternatives for a possible starter line. The open house is between 4-6:30 pm in the Helzberg Auditorium at the Central Branch of the Kansas City Public Library at 10th and Main. Short, identical presentations will be given at 4:30 and 5:30 p.m. The partnership team has set up a Downtown Corridor Alternatives Analysis webpage. Under Study Materials get the FAQ and Fact Sheet #1 which includes a map. This forum will focus on the report Missed Opportunity: Transit and Jobs in Metropolitan America which ranks the top 100 cities for transit access to jobs. Following the presentation, there will be an open discussion on current transit initiatives and the crafting of a regional response to this report. This meeting is open to the public. Brookings divided the metro area into the CITY and the SUBURBS. The CITY is defined as both the city of Kansas City and the Unified Government of Wyandotte County. Everything else in the metro is the SUBURBS. Unfortunately the suburbs in their study go so far out that a lot of rural area is included. The report evaluates the ability of people within ¾ mile of a transit stop or station to get to work in 90 minutes using public transit. Brookings is measuring if transit is even possible to take to work. We don’t fully agree with Brookings approach, for instance many people in the suburbs who live farther than ¾ mile from a transit stop have transit access to work using park and ride lots. Even with our concerns about the report, it does point out the seriousness of our transit situation. 80% of the CITY has transit coverage but only 25% of the jobs in the metro area are accessible by that transit. The report says only 33% of the suburbs have transit coverage but only 10% of all jobs are reachable by transit in 90 minutes from the suburbs. The overall KC job access rate for the metro area is calculated at 18%. Of course the biggest question is how will the region use this information to better serve the needs of the community with transit. Since it will take more than “throwing money at transit” to achieve these ends, such as providing a transit option to more of the region’s residents for access to jobs and other opportunities, it will take deliberate attention to where future development is located, especially when public incentives are involved. Although there are notable improvements recently, continued efforts are needed between the transit providers to provide a seamless transit experience for riders. This forum is open to the public and if you are interested in transit please come take part. TAN will be present to make sure we understand WHY we rated so low and to help develop a response. Multiple comments and criticisms relating to the new transit report are showing up in the media and on the blogs including TAN’s article last week. You may find them interesting reading. One item that seems to drive several bloggers crazy is that New York didn’t come out on top and it was beaten by some small cities. Honolulu came out number one. Brookings has responded to Nate’s comments with further explanations about the report. New York has a great transit system but not everyone in the suburbs has access which lowered its ranking. Do 12 American Regions Have Better Transit Access Than NYC? Doubtful. You are looking for a classic movie musical for free. 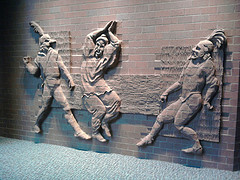 You want to visit a free beautiful art museum. You want to use Johnson County Transit (AKA “The JO”) to get there. Here is the “Transit Adventure to a Movie Musical and Museum” deal for you! Johnson County Community College is offering a free Wednesday morning film series during June at Yardley Hall in the Carlsen Center on campus. Films begin at 10:00 am. 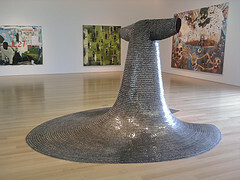 Art work in the Nerman Museum "Some/One"
After the movie you can enjoy the art work on display just a few steps away at the Nerman Museum of Contemporary Art. Have lunch at Cafe Tempo at the Nerman, or at the food court in the Student Center, and explore the campus. Sure, you could drive there, but we encourage you to give The JO a try. Depart from the bus shelter at 2345 Grand (NE corner of Pershing and Grand) via Route 660(A) at 7:45 or 8:15 am. Use your Metro transfer or pay $2.00 cash fare. Arrive at Carlsen Center 75 minutes later, in plenty of time for coffee and the movie. Depart from Carlsen Center via Route 660(A) at 3:05, 3:35, or 4:00, arriving at 2345 Grand about 68 minutes later. Depart from Northbound MAX stop next to Tennis Courts via Route 556 at 7:53 am. Use your Metro transfer or pay $2.00 fare. Arrive at 6000 Lamar Transfer Center about 20 minutes later and transfer to Route 660(A) at 8:22 am. Arrive at Carlsen Center in plenty of time for coffee and the movie at 10:00. Depart from Carlsen Center via Route 660(A) at 4:00. Pay $2.00 cash fare and ask for a transfer. Arrive at 6000 Lamar in time to transfer to Route 556(H), departing from 6000 Lamar via Route 556(H) at 4:45 pm and arriving at Plaza about 17 minutes later. Depart from Waldo MAX stop at 74th and Broadway at 7:35 am. (Note: This is a small bus.) Use your Metro transfer or pay $2.00 fare. Depart from Carlsen Center via Route 875 at 12:11 or 1:41 pm, and arrive at Waldo MAX stop about 70 minutes later. Regular fares are $1.50 (Metro) and $2.00 (The JO). 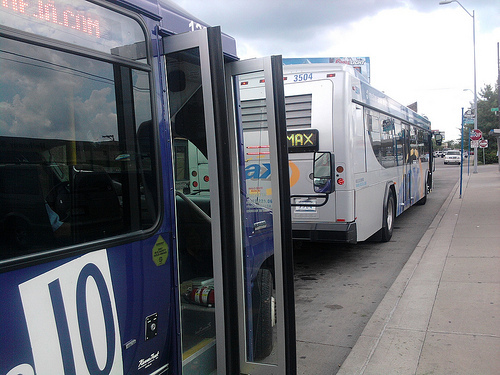 We suggest you use MAX or another Metro route to reach the above departure points. 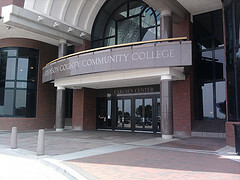 Pay the regular Metro fare, ask for a transfer, and use that transfer to board the JCT bus for your trip to JCCC. For the return trip in the afternoon, pay the regular $2.00 fare and use your transfer to board MAX or any other Metro bus. Verify times or check other departures at TheJO. 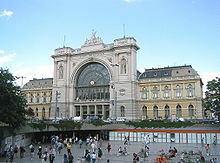 The only rainy day on our trip was spent taking the express train from Budapest’s Keleti Station to Prague’s Hlavani Nadrazi Station. This is central Europe so this wasn’t high-speed rail, but as an express train it didn’t have a lot of stops. This train took 7 hours to cover 275 miles. We purchased our tickets online at RailEurope before we left home. We had a 1st class compartment and since it was low season we had it all to ourselves. It was great to be in a comfortable train all day watching the geography and agriculture of Hungary, Slovakia and the Czech Republic go by on a rainy day. 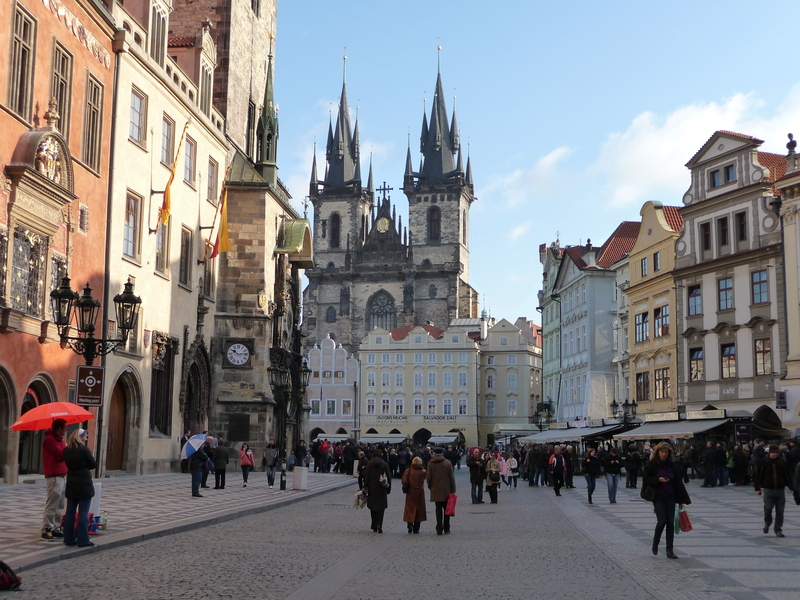 UNESCO listed Prague’s extensive historic center as a World Heritage site in 1992. Prague wasn’t bombed in WWII, unlike Budapest(see previous post). 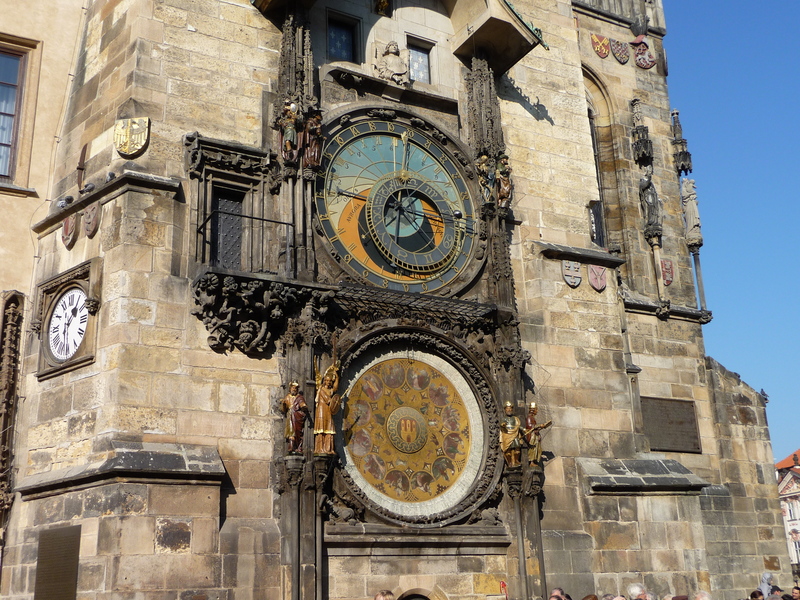 Prague’s Old Town (Staré Město) is an amazing concentration of historical sites, churches, a Jewish quarter, a huge astronomical clock (a main tourist attraction) and winding streets all in the shadow of a 9th century castle and St Vitus Cathedral. We stayed in the heart of the old medieval town in a 14thcentury building that had been converted to a hotel and residential building, so we walked everywhere. 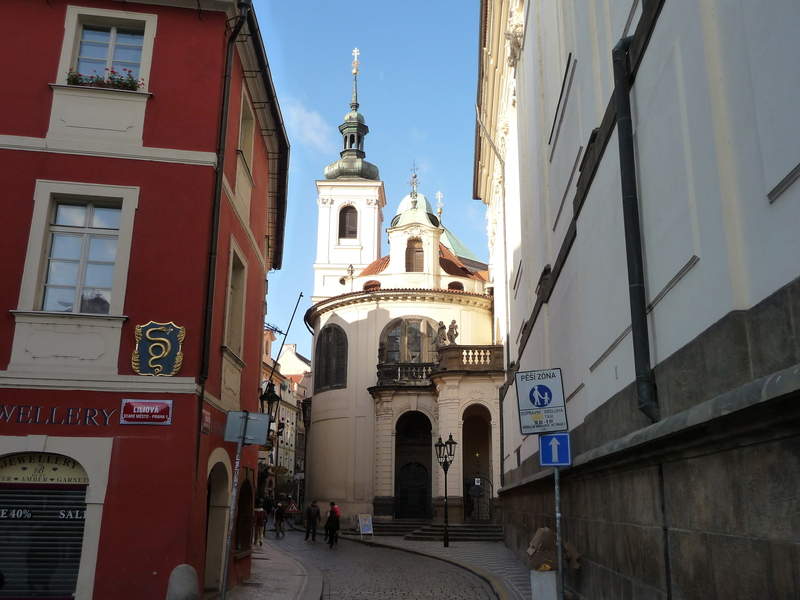 If you visit Prague I hope your ankles and legs are in good shape because you will be walking on lots of narrow, convoluted, cobblestone streets and up lots of steps. 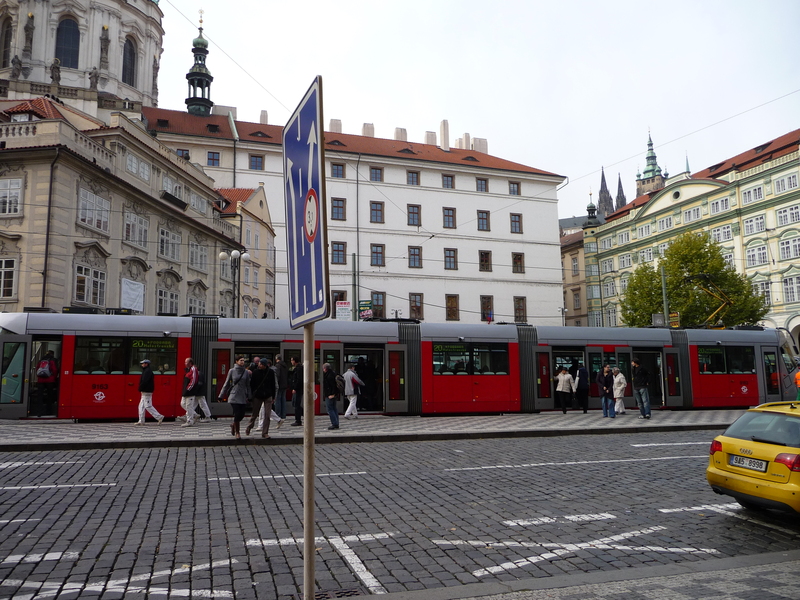 Walking and public transit are the way to see Prague. Biking isn’t usually recommended in the tourist areas since the streets are so narrow and the cobblestones make very bumpy rides plus all this is mixed in with cars and small trucks. You see very few people on bikes in the Old Town. 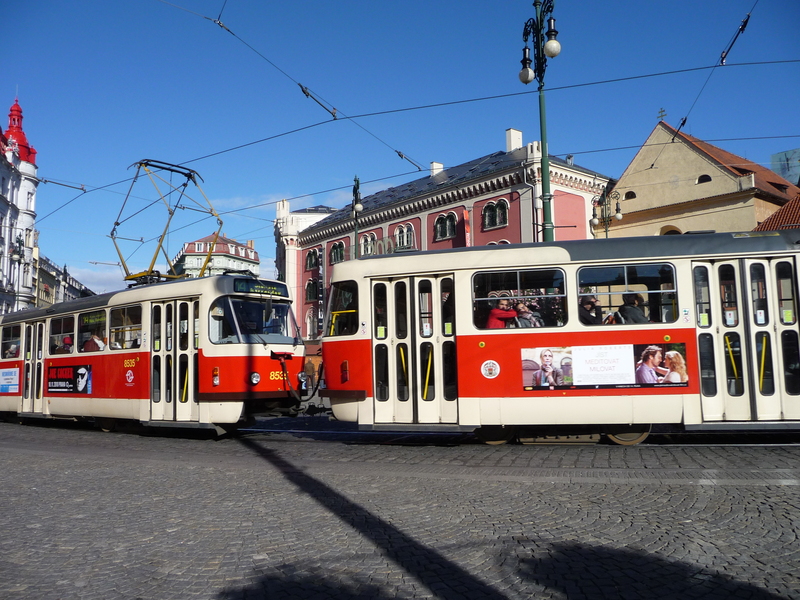 Cars are allowed in the Old Town and trams go around the outer part but buses are not allowed in the Old Town except for some tourist buses to pick people up in the main square. 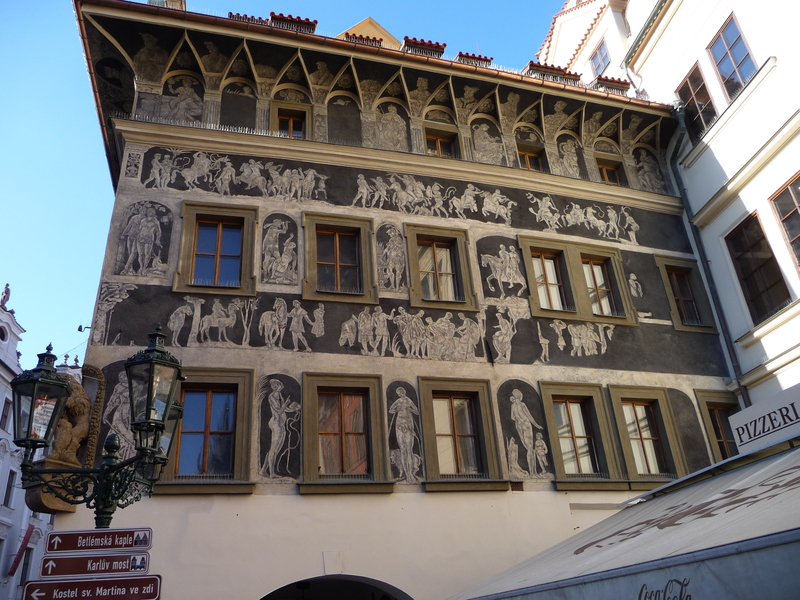 There are several parts of the historic district, the Old Town where the peasants and merchants lived and across the Vltava River to Lesser Town and up the Castle Hill to the castle area where the rulers live. The set up is similar to Budapest except these weren’t administered as separate towns. 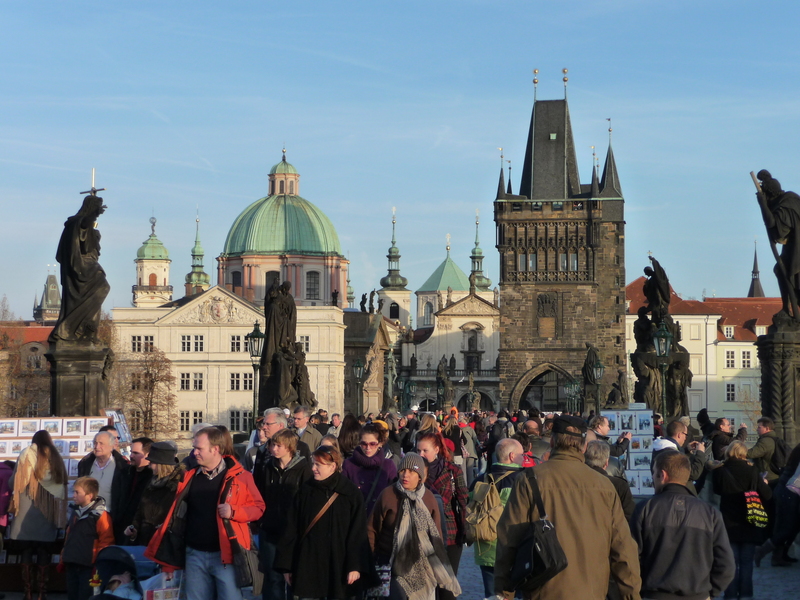 The Charles Bridge connects Old Town and Lesser Town on your way to the Castle. 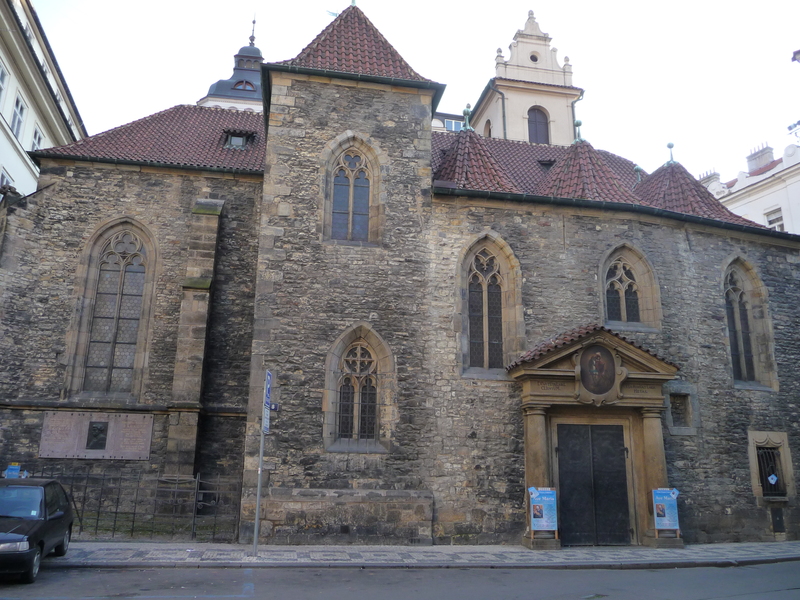 On the river’s bank in Lesser Town is the Franz KafkaMuseum, worth it if you are a fan. 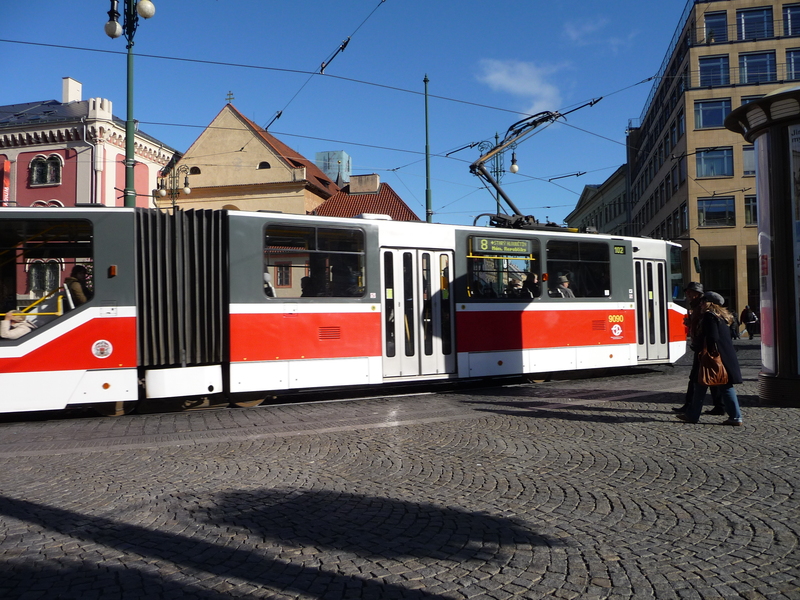 Outside of the Old Town, Prague has a one of the best transit systems in Europe with a metro (subway – 3 lines, 400 million passengers a year), trams (26 lines, 300 million passengers a year) and buses. The metro is only 30 years old and mostly Russian built. Two thirds of the population uses public transit. Single and transfer tickets are available at yellow vending machines. Tickets may also be purchased at metro ticket offices, tourist information offices and newspaper stands. 1, 3 and 5 day passes are available. 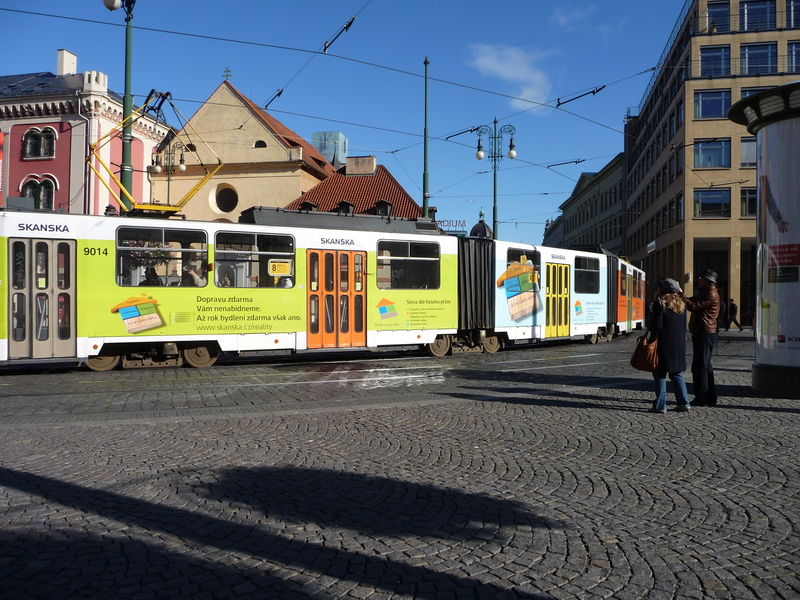 In Prague you can also purchase transfer tickets through your mobile phone and have the ticket delivered to your phone in one minute. Very technically up to date. 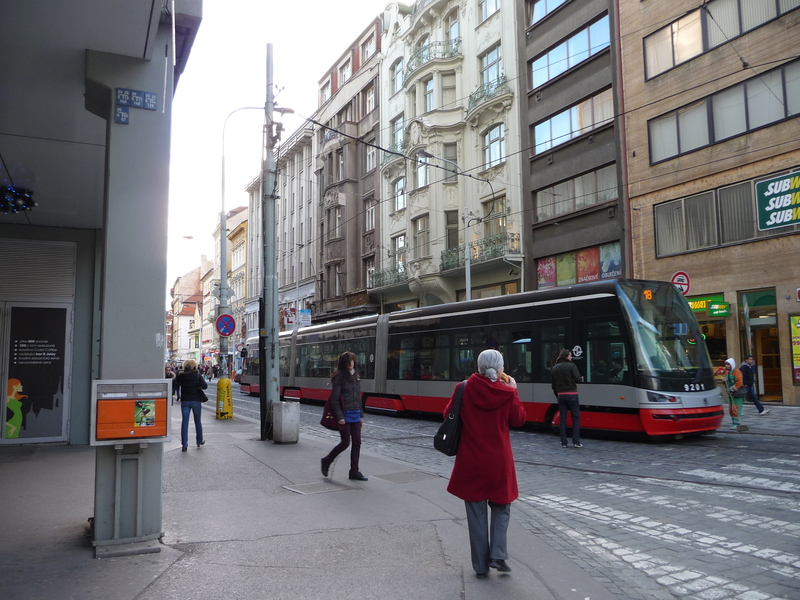 If you visit in high season it might be cheaper to stay just outside the Old Town and take a tram in. Some tourist buses come in to the Old Town Square (Staromestske) like the HOP ON HOP OFF bus but they don’t stay. The HOP ON HOP OFF bus in Prague mainly does a trip around the perimeter of the Old Town and castle, so we didn’t take it. No buses are allowed in the Old Town and with such an excellent metro and tram system most public transit buses are on the outskirts of the city. Prague’s taxis have a bad reputation so ask the price from your hotel before using them and make an agreement before you get in. 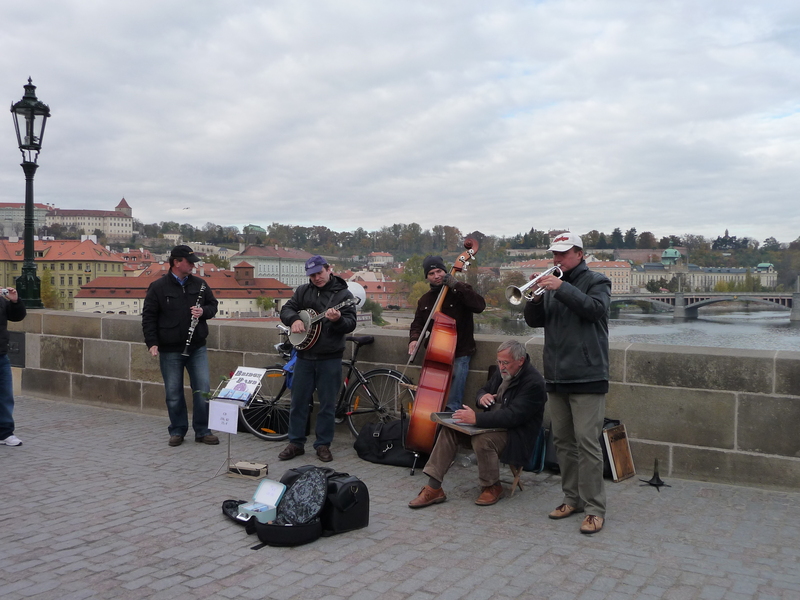 Prague is renowned for its music. 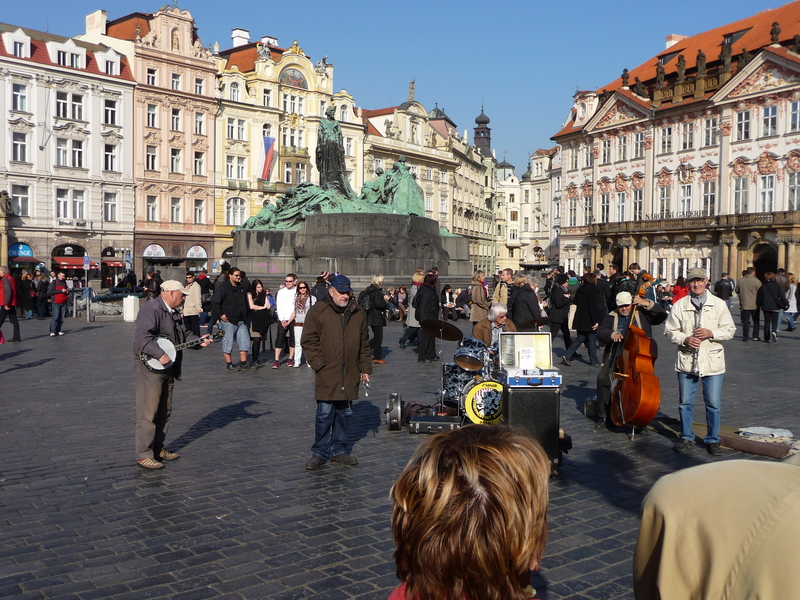 There are bands in the Old Town Square and on the Charles Bridge, our hotel had a blues club in the basement, Susan Vega performed one night at the Hard Rock Café just off the Old Town Square, every church has concerts and there are the Prague symphony and opera houses. All of it is delicious and depends on your time, interest and pocketbook. The concerts in the churches are a big tourist attraction and since these are all stone churches with vaulted ceilings, the sound is very beautiful. Although we went to several church concerts that were excellent, I want to recommend a small ancient, beautifully preserved church, St. Martin in the Wall. The big churches are more famous; their interiors are beautiful and sometimes so over the top with Baroque decorations that they are a bit gaudy for me. However St. Martin in the Wall is very old and built into the side of the Old Town wall. It has barren stone walls and a small chapel. We experienced the best sound quality with an amazing performance in this unassuming venue. You will need a full day to explore the Castle area, the largest in Europe. The Castle consists of a lot of different buildings with courtyards. 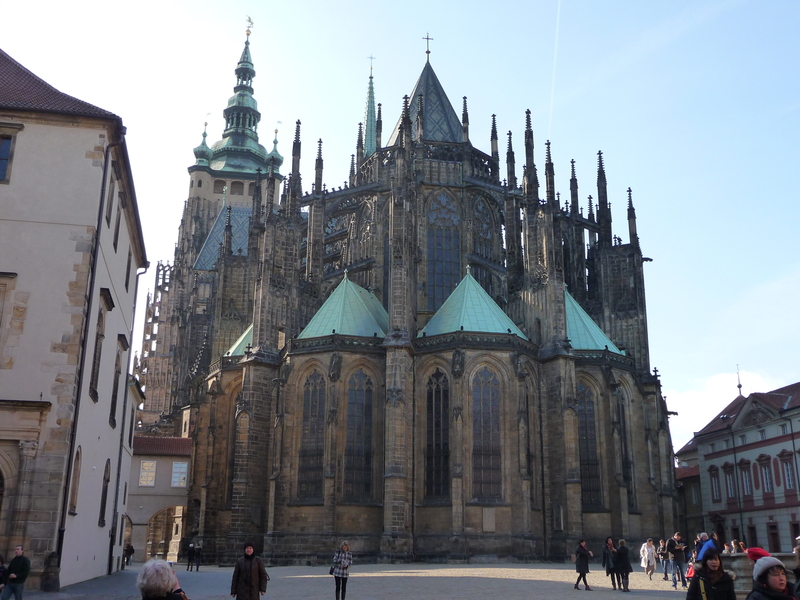 In the center of the complex is St. Vitus Cathedral. It is very impressive and if you are up to it climb the winding staircase up the South Bell tower, 287 steep narrow steps. Go as early in the day as possible before it gets really crowded. I waited for my husband who thinks that all towers were created for him to climb. The cathedral is magnificent. I suggest you get an audio guide to the castle district and the cathedral if you are really interested in exploring this site. Part of the fun of the Castle is getting there. The Castle steps are famous and there are two choices. 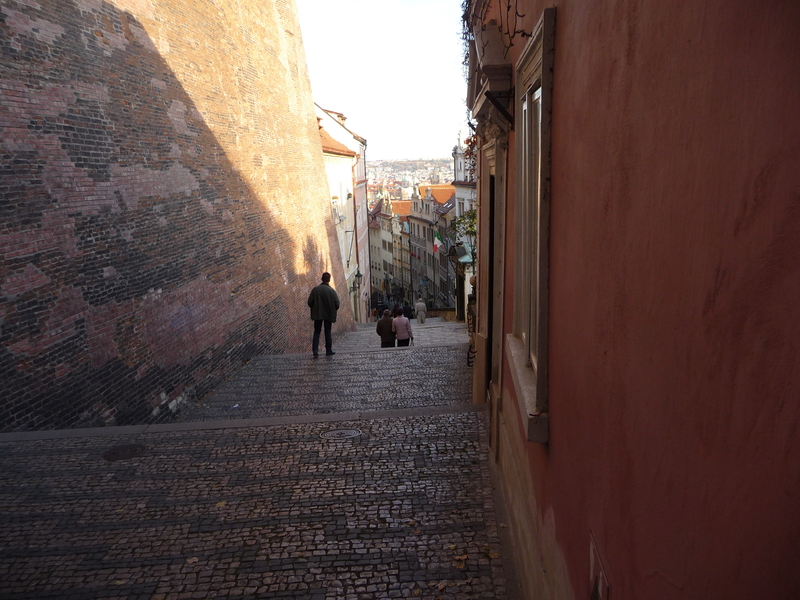 Since none of the trams were close to our location in the Old Town, we zigzagged up the streets so the trip was not as steep as the castle steps. We walked down the Old Castle steps at the end of the day. 1. Castle Steps (Zámecké schody) – these are considered the romantic Castle Stairs, which will take you to the Garden on the Ramparts (Zahrada na Valech). 2. Old Castle Steps (Staré zámecké schody) – These are near the Malostranská metro station and Jiřská street. 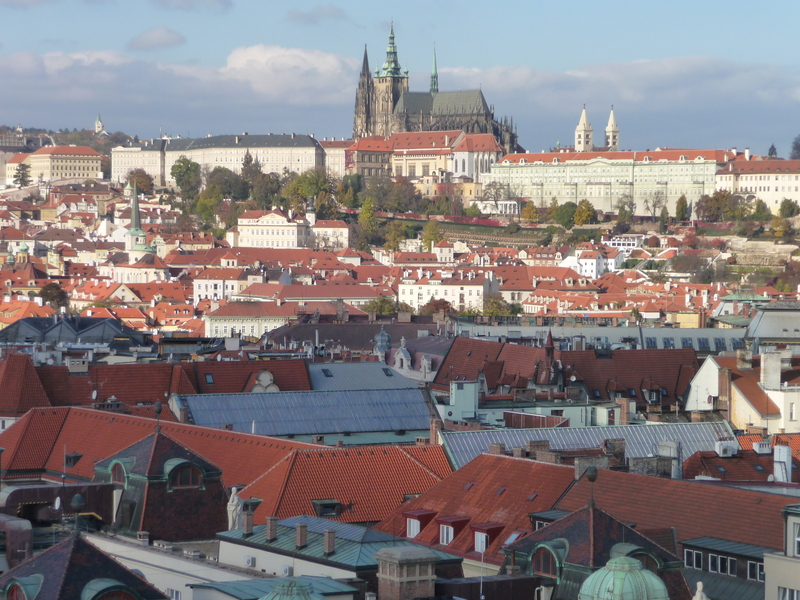 You will be rewarded with one of the most beautiful views of Prague. 2. Pražský hrad – this is considered the main Prague Castle stop. Get off here if you would like to start at the Second Courtyard. 3. Pohořelec – getting off here will enable you to walk to the Castle through Hradčany and arrive at the main entrance. Considered the nicest route. A good way to go is to take the tram up to the Castle and walk back down when you’re done. 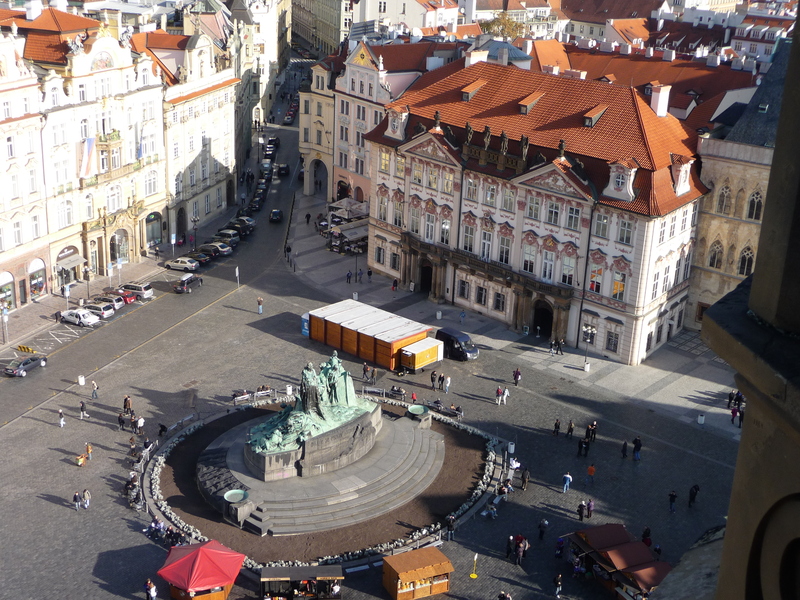 A five-minute walk from the Old Town Square is New Town (east and south of the Old Town), dominated with wide straight streets set out in a grid. 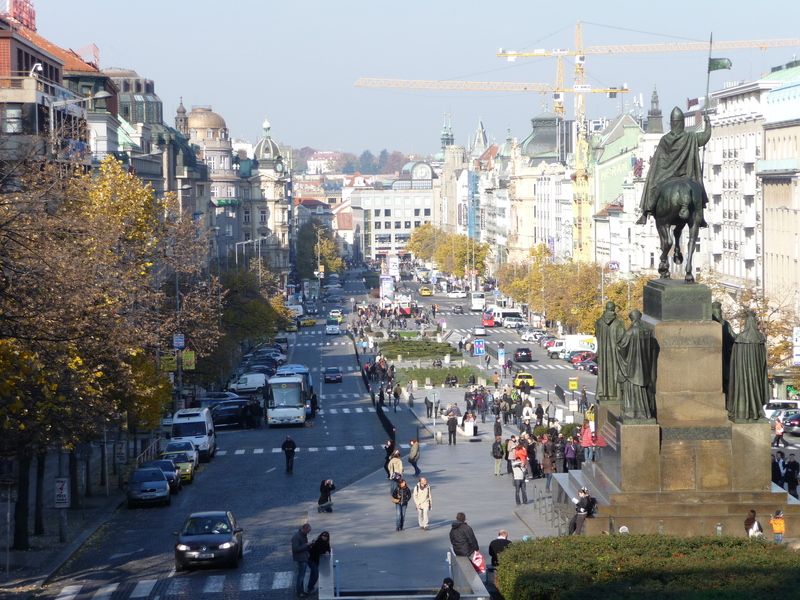 Wenceslas Square has a huge statue of Saint Wenceslas (yes, the one from the Christmas song) at the top of the street. Of course the Good King was really a prince and is considered the founder of the kingdom. His brother killed him in 935 AD. So much for family values! 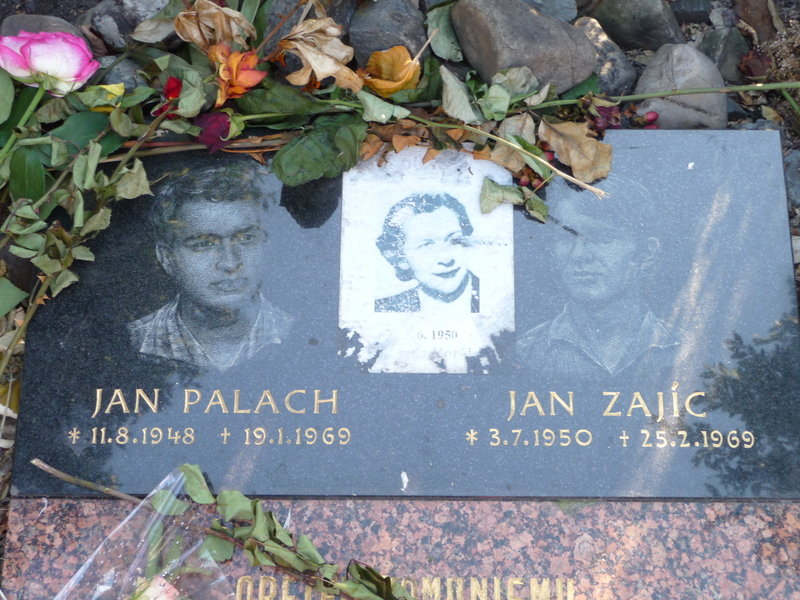 Part to the way down Wenceslas Square is a small memorial to Jan Palach who set himself on fire January 1969 to protest the Russian occupation and the demoralization of the Czech people. At the bottom of the street starts a long pedestrianized shopping area with all the top designer shops and lots of restaurants. 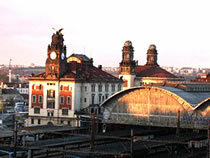 Prague is also known for its beer. 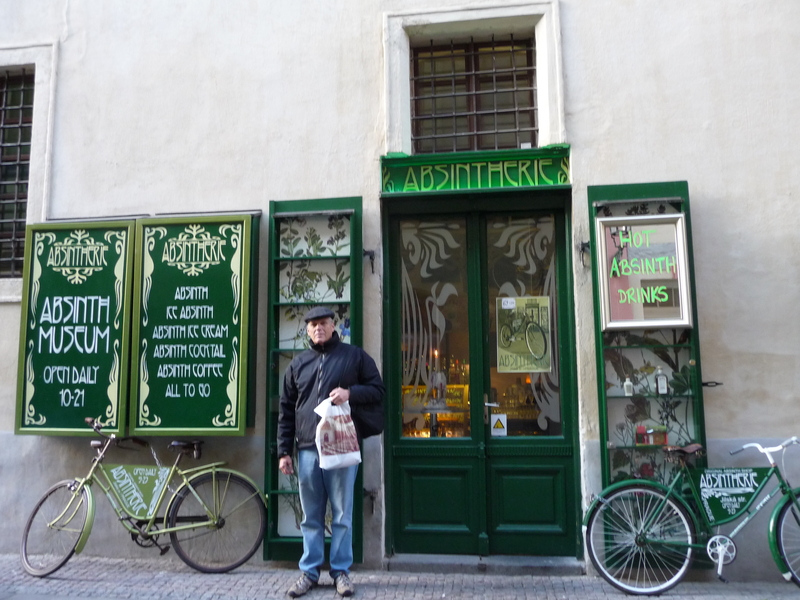 However, you’ll see Absinthe (the Green Fairy) being sold everywhere in Prague. It’s bad reputation and subsequent ban throughout most of the western world came from the disastrous effects it had on French artists in the 1900’s. However, the ill health effects and early deaths were mainly related to becoming alcoholics, not the wormwood in the drink. The US ban was lifted in 2007. 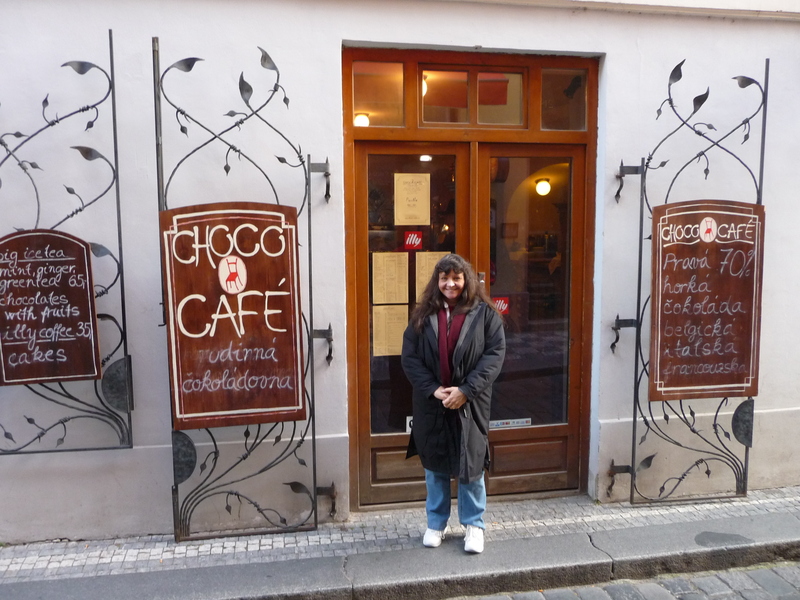 It is good I don’t live in Prague because I would die from chocolate overdose at the Choco Café. The dark hot chocolate (70%) is so thick you need a spoon (it is actually referred to a spooning chocolate). I ordered mine with wild berries but they had lots of fruit choices and combinations. Drinking a whole mug must have equaled several candy bars. They also have great food.